Here I have collected some measurements and information about the Miata bumpstops and their role in the suspension setup. This page was a subsection of my Ground Control setup page but it grew enough to be useful in its own right regardless of which spring kit is being used. 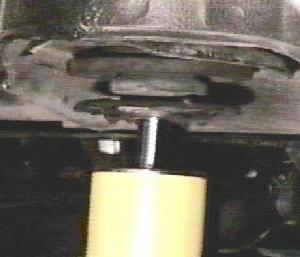 Before I started experimenting with the GC installation I assumed the bumpstop were a more or less solid chunk of rubber whose role was merely to protect the shock from hitting metal when the suspension bottomed out severly due to potholes or similar anomalies. I assumed that the shock would never ride or touch these under normal cirumstances, whether commuting or performance driving. Turns out that was all wrong. 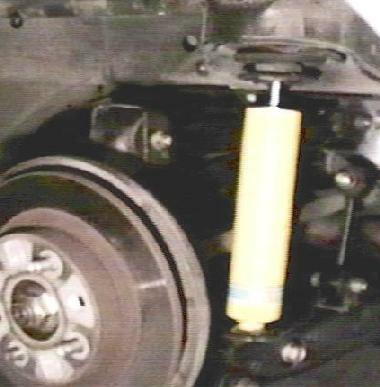 The bump stops are an integral part of the suspension travel in the Miata. They offer a progressive spring rate, additive to whatever spring rate the spring itself may have. Finding a ride height which does not "bottom out" onto the bumpstops (which I tried to do for the initial coilover installation) is not only not necessary, but impossible. A Miata even with its stock suspension corners on the bumpstops essentially all the time. While driving in a straight line, the soft springs provide a nice ride. As soon as cornering forces go beyond suburban commuting, the bump stops add from several hundred to a thousand lbs/in of spring rate to the equation, giving nice handling. So what is the spring rate of the bump stops? 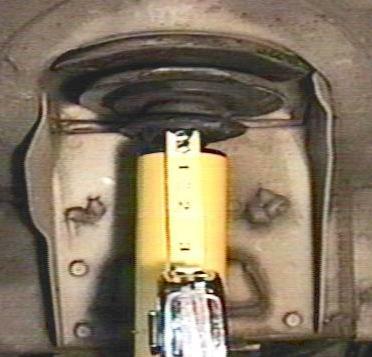 In the Jan/Feb 1998 issue of GRM (p.17), it states that the Miata bump stops have the following spring rates. However, take these figures with a grain of salt. 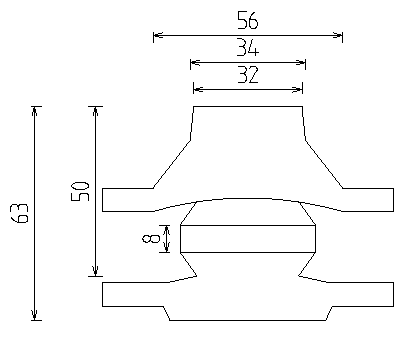 I am not sure what they were measuring, but the entire bumpstop is less than four inches long, so these numbers must be wrong in some way? In a posting to the miatapower list it states that from experimentation the spring rates appear to start out much softer, around 40in/lb, going up to 1000 or so (as stated above). New in 2006: Shaikh gave me a graph with partial measurements from a 'new' OEM bumpstop (see brown triangles). 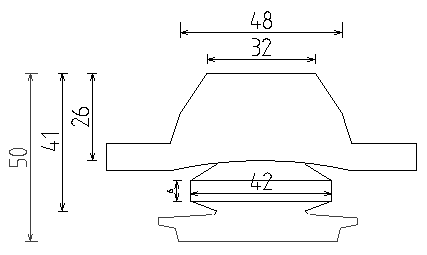 The different numbers may be explained in part by the fact that there are two types of bumpstops used in Miatas. What I'll call the 'old' and 'new'. 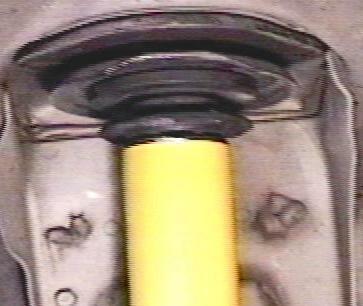 The 'old' (NA01-28-111) ones were used in 90-93 1.6l Miatas. The 94+ 1.8l cars use the 'new' (N021-34-111) ones in the front and the 'old' ones in the rear. The R package cars, as well as the '93LE, use the 'new' bumps in all four corners. (This is on USA-spec Miatas, others may be different?). Thanks to Tommy [aka Parts Dood] for this info. 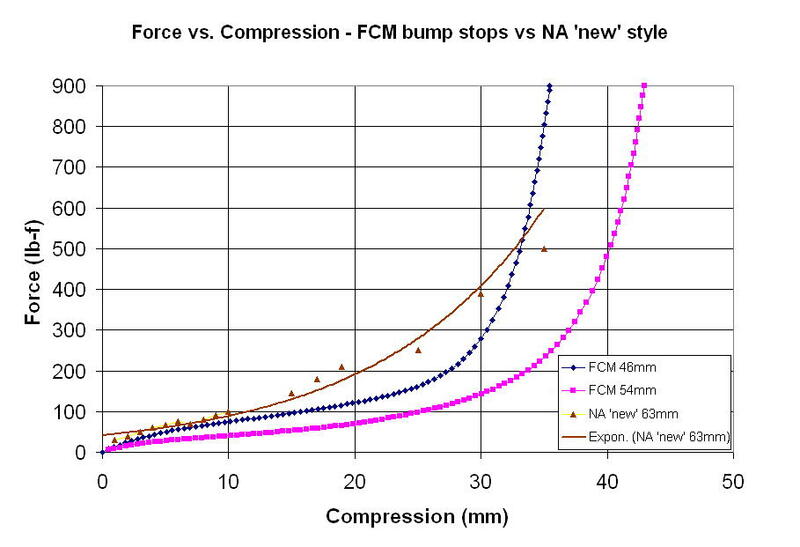 Below are the two bumpstops with some measurement data. All dimensions are in mm. As you can see, the 'new' bumpstop is a good bit longer. Presumably it offers a larger range of spring rate, starting out softer. Keep these differences in mind when comparing setups if the cars don't have the same style bumpstop. A question that seems to come up often is how much travel there really is available before the shock contacts the bumpstop. The following table shows the distance from the shock to the bumpstop at various ride heights. 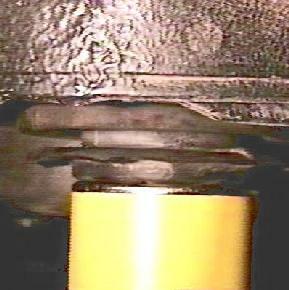 The shock is a Bilstein, and the measurements were taken with an 'old' style bumpstop. Substract 13mm from the available travel if you are using the 'new' style bumpstops. Ride height is measured from fender lip to hub center. 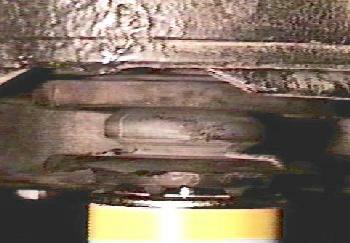 The picture above is the rear suspension at 14" ride height. It is easy to conclude from the above pictures and numbers that if the car is to be lowered by any non-trivial amount, the bumpstops probably need to be cut. With 'old' style bumpstops a ride height any lower than 12.5F/12.75R will be permanently riding on the bumps, quickly leading to a very harsh ride on anything but glass-smooth roads. But what happens if the bumpstops are cut too much as was the case with my initial GC install? My rear bumpstops were cut nearly to nonexistence. I only had the top hat portion of the bumpstop. Looking at Figure #1 above, only the top 26mm section was left. (In the front I had 41mm, consisting of the 'hat' plus the first 'donut'). The result of this is that I had more travel before the shock contacted the bump. However, once it did bottom out, the spring rate went from 450lbs/in (of the spring) to somewhere over 1000lbs/in in a very short distance of suspension travel. This non-linear increase could be felt at the track, as the rear end of the car would suddenly stiffen up considerably. For predictable handling the goal should be to achieve a reasonably progressive spring rate vs. travel graph. My suggestion is to draw such a travel vs. rate graph before deciding on spring rates and ride heights and how much to cut off the bumpstops. Unfortunaly there is no precise data on the bumpstop spring rates, but the numbers quoted above should provide a starting place at the very least. Based on the above analysis I decided to keep full length 'new' style bumpstops and a stock ride height. As documented in my GC page, the results have been very good. New in 2006: Check out http://www.fatcatmotorsports.com/ for a nice solution to gaining some much-needed suspension travel.